The (Advent) Sundays in our Christmas Countdown are filled with special highlights and we don't really wanna talk much around this one: we are just so so so happy to be able to give away one signed (!) copy of Efterklang's amazing record "Piramida"! Efterklang is a Danish band like no other. Since their first record, these guys started a new philosophy of making music. Efterklang combines folk sounds with electronic and modern tunes in a very organic and natural way. Their latest album "Piramida" was made after the trip to the abandoned city of Piramida at Spitzbergen. The Danes went there to get to know the story and collect sounds to use on the album. The effect is stunning - especially heard live. Efterklang concerts are the most magical music experience you can think of. The delicacy, the humour, the style - this band has it all and uses it well to bring joy to the audience and listeners all over the world. It's actually very hard to describe this group and their music. The best way is to just listen to it and find out what Efterklang is. 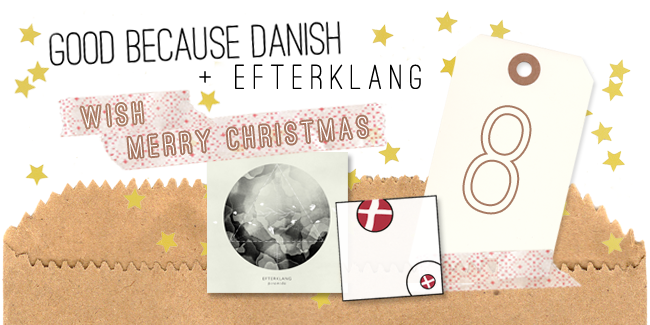 Write a mail with the subject "Christmas Countdown: Efterklang" to goodbecausedanish@gmail.com and tell us in what place of the world you would love to record sounds (for your fictional record)! Don't forget to also include your address into the mail. Deadline is 18 December 2013.